Many people in the world look at blogging as one of two things...it's like looking at yourself in one of those 10x mirrors first thing in the morning, before you've washed your face and you still have sleep in your eyes...or it's like placing your life in an unscripted reality television show. Those of us who have been blogging for a while know this to not be true. We may have been wary and nervous at first. We may not have known how much is okay to share. Sometimes too much information is uncomfortable for the reader, but in other scenarios it helps a reader - so how open is your open-book policy when when you're writing a post? If you've prepared beforehand, and you know your blogging boundaries, and you know your readership, then you shouldn't have any issues arise from sharing your soul to the extent you choose. If you're new to blogging it's always a good idea to create parameters for yourself, unwritten rules, or even written down and pinned to your bulletin board...what will you NOT write about and NOT share with the world? Is your blog a JOURNAL exposing your inner self? Is it a scrapbook you will want to share with your children and grandchildren? If you're not sure of the answers, then it might be best to start slowly, take baby steps toward total honesty in the blogosphere. Don't get me wrong, there are some bloggers who make a living at letting it all hang out, and more kudos to them (I suppose). If your goal is to be a shock-blogger then by all mean jump in all the way! Did you know you can set your blog to PRIVATE so only you can read it? This is a great choice for many who just need to empty their souls and make lists and move on...no need to let everyone learn about your dirty laundry right? More people know about blogging than ever before...it's hard to find someone who hasn't heard of it, even if they don't know what it is. Are you hoping to start a blog soon? Or have you been blogging for years and only have 15 followers? Is gaining a large readership what you're really going for? Are you looking for recognition and gauging your success on how many followers you have? Well, you shouldn't. Did you know you may have readers that only read your posts in their browser's blog reader? They never actually click on your site or page through it or ever leave comments? And the opposite is true too...you may have a thousand followers and no one ever reads your posts...you know this is true. How many blogs do you follow that you never read? There is absolutely nothing wrong with having only a few followers. Do not blog for followers, because you will most likely be disappointed. Just saying. Abraham Lincoln said: "Don't worry when you are not recognized, but strive to be worthy of recognition." This is a great quote to remember when you are working away on your blog and your kids are whining at you to come and play or make them a snack...or you're avoiding finishing a project...or living vicariously through your laptop. 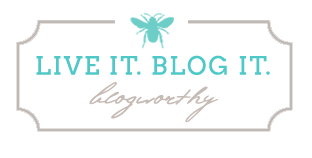 Live your life well and live big, and in the little moments in between, that's when you can blog about it. Don't spend all your time blogging while life moves around you...you will be missing out on what's most important - YOU. This post will be part of our Live It. Blog It. Blogworthy E-book that is currently in the works. Lots of good points to remember. I only tend to blog what I think others will e interested in and my life is pretty low key (boring? ), so I don't blog often, lol. I sometimes take it personally when I don't get a lot of comments. I love this quote! Great words to live by. I am in full agreement with your last paragraph. Yes, yes, and yes again. We all must remember those words. Words of wisdom. Well said!!! I totally agree with the sentiment of the post ... unfortunately, those of us who are "trying" to blog to earn money NEED the large followers, the massive monthly page views, the ever-growing new traffic for our blogs because THAT is what a lot of sponsors and blog review/giveaway sponsors are looking for. At least, that's the problem that I am running in to. I would love to be able to find one blog that tells you WHERE to go to get products to review/giveaway, HOW to contact companies to ask them to work with you, and the rest of it - the blasting across FB and Twitter and Google+ I can take care of on my own because I already do that with most everything I post. That's been my problem --- finding out the HOW and the WHERE to look and to go. What a good post! Very well said!! Great post! I have been blogging for around seven years. I have a very small handful of followers, that only grew to more than a couple dozen very recently. Seven years! Few followers - but I'm extremely proud of my content, every single post. It's content my family can read. I get wonderful feedback from people close to me, and occasional strangers. Mostly, I do it because it makes me feel good to sort my thoughts, share an idea, and it's part of my creative personality & love for writing & photography. Sure it would be lovely to be recognized by, and reach more. But few followers hasn't stopped me in seven years - If it inspires even just a small handful, I'm creating my ripple. That said: here is a very old post I wrote on "the butterfly effect."